* “Menace of the Man Missile”, pages 1 and 9. Pencils by Carmine Infantino. * “Castle with Wall to Wall Danger” pages 7 and 8. Pencils by Carmine Infantino. 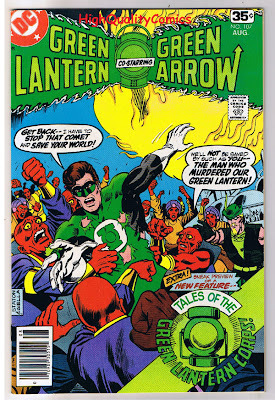 * Green Lantern/Green Arrow #107 cover. Pencils by Joe Staton. Please re-post this notice to as many places possible. If you hear of this art being offered, please contact Detective John O'Connor, Nassau County Police Dept., Third Squad, phone: 516-573-6353. Tony Isabella just advised me that this story was broken weeks ago (I must've been sleeping) but it never hurts to remind folks.